A Trio of Pink Beaded Anklets: Ballet, Beaches and Trendy! Not all of us are dreamers, but I am! As a little girl...I dreamed; dreamed about being a beautiful and graceful ballerina! Those dreams are what inspired this first handmade beaded jewelry anklet. This handcrafted beaded anklet was created as a symbol of little girls' dreams, feminine beauty and the grace of ballet dancers. Design features two graceful shades of muted pink Swarovski Crystals, sterling silver beads, Bali and frosted white seed beads. Finished with a sterling silver ballet slipper charm and signature jewelry tag. Measures 10". As a family, we used to take annual summer vacations by camping at the 1,000 Islands, Alexandria Bay in Clayton New York. I have some really fond childhood memories of these vacations and spending time with my older brother at the beach -those were special and precious times. We would spend most all our time at the beach and I loved how the sand felt between my toes! These memories are what inspired this second anklet design. Get the feeling of walking on sparkling summer sand with this handcrafted sandy beaches beaded anklet. Design features beautiful pink and tan Swarovski Crystals, sterling silver beads and .925 Bali with natural polished Mother of Pearl shell beads. Finished with a double crystal drop charm and signature jewelry tag. Measures 10-1/2". This next bead anklet bracelet may look familiar -as it should -because you can find it in the color combination of green and brown: Crystal Peridot Brown Charm Beaded Anklet (A104). It was inspired by my love of fashion and style. I happen to love the color brown and when the color combinations of pink with brown and blue with brown came out, I was thrilled. 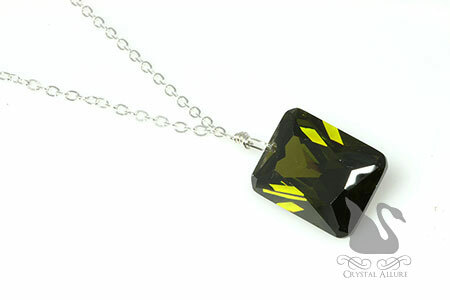 I simply couldn't resist incorporating these chic color combinations into a crystal jewelry design! Handcrafted beaded anklet features beautiful pink Swarovski Crystals, sterling silver beads, Bali and chocolate-bronze seed beads. Finished with a double crystal drop charm and signature jewelry tag. Measures 10-1/4". If you love this design, it can be remade (while supplies last) in the same color (pink and brown) or you can customize it with a different color crystal. Feel free to contact me to discuss custom ordering this crystal anklet. Pink and brown is one of my favorite combinations and I absolutely love the sparkle! Once again, it is even more beautiful in person. I only wish I had gotten it earlier in the summer. You may recall the article Part 1: Types of Metals Used in Jewelry: Gold. This is a continuation of that same idea except in this jewelry article we will be looking at silver metals used in handmade jewelry. By far, I believe silver is the more popular metal to use in handmade jewelry. Below is an outline of some of the more common silver metals used in handmade jewelry design, ranging from fine jewelry to fashion jewelry. At Crystal Allure Beaded Jewelry, I have worked with a few different metals throughout the years and although I have no particular preference of one over the other, my unique handmade designs currently showcase either sterling silver, 14 karat gold-fill and/or vermeil (pronounced vehr-MAY). There are times when a particular component I would like to use can only be found in pewter, silver plate or gold plate. When I use a metal other than a precious metal, I always state as such in the description of the jewelry piece. RHODIUM PLATE - Rhodium plating is occasionally used on white gold, silver or copper and its alloys. A barrier layer of nickel is usually deposited on silver first, though in this case it is not to prevent migration of silver through rhodium, but to prevent contamination of the rhodium bath with silver and copper, which slightly dissolve in the sulfuric acid, usually present in the bath composition. Rhodium is a metal derivative of platinum and is very white, reflective, extremely hard and virtually tarnish proof. It presents outstanding chemical inertness (will not react or change easily) thus, rhodium will not tarnish whereas silver will. It is very expensive, so only a very thin plate is applied to reduce the amount of metal used in the bead or component. If not subject to excessive friction and wear, rhodium plated jewelry will retain their look indefinitely. Rhodium is also hypoallergenic. Rhodium protective coating is useful for white gold which often contains nickel to give it a white sheen look. It is well known that nickel is not bio-compatible and approximately 15% of people suffer from some kind of allergies to nickel. Thus rhodium serves as an additional layer between skin and base metal preventing skin from irritation. Rhodium is the most common plating material used to plate Sterling Silver because it provides a bright mirror like finish and it is also silver in color. An article of yellow gold jewelry can be made to look like it is white gold by having it Rhodium plated. A Rhodium plated item may retain its finish for a lifetime or for only a short period of time, depending upon factors such as the type of metal being plated, the amount of wear the article is subjected to, each individuals body chemistry and the thickness of the plating. The good news is that if the rhodium finish on a piece of jewelry wears off over time, it can be re-plated to look brand new and the process is not very expensive. STERLING SILVER - Pure silver, also called fine silver, is relatively soft, very malleable, and easily damaged so it is commonly combined with other metals to produce a more durable product. The most popular of these alloys is sterling silver, which consists of 92.5% silver and 7.5% copper. Although any metal can make up the 7.5 percent non-silver portion of sterling, centuries of experimentation have shown copper to be its best companion, improving the metal's hardness and durability without affecting its beautiful color. The small amount of copper added to sterling has very little effect on the metal's value. Instead, the price of the silver item is affected by the labor involved in making the item, the skill of the craftsman, and the intricacy of the design. Sterling silver is a white and highly reflective precious metal. It can be antiqued or given a high polish. Crystal Allure Beaded Jewelry uses both antiqued and polished sterling silver beads and components. A silver anti-tarnish cloth can be used to clean the outer edges of the sterling beads and leave the inner antiqued crevices antiqued. Do NOT use a Sterling Dip to clean your antiqued jewelry. Sterling silver is the standard for beautiful high-quality silver jewelry. It's over 90% pure silver, mixed with alloys to add strength and durability. And it won't wear down, as silver plating can. PEWTER - Pewter is an alloy of tin, lead, antimony, and a bit of silver or copper. Pewter was the most widely used metal in America between the early 1700 and 1800's. The best pewter is achieved using a low lead content and a high tin content. As you would expect, U.S. pewter manufacturer's today are required to make lead free pewter. Both copper and antimony are added to the tin to make a harder metal alloy. BASE METAL - Non-precious metals used as a core for plating and gold-filled items. Brass and nickel are common base metals in jewelry. SILVER PLATED - A fine silver film deposited on a base metal by electrolysis, in the same kind of electrically-charged bath used to make gold electroplate. The film can be as thin as seven millionths of an inch. A silver plate item cannot be called sterling or bear a marking of "silver". Historically, silver plate was used to provide a lower cost version of items that might otherwise be made of silver, including cutlery and candlesticks. Ahhhh, finally -Spring has arrived!! It's the first full day of Spring and the anticipation of flower bulbs popping up, birds chirping and the sun shining, is making me very excited. I can't wait to get working on the gardens. Until then, I'm focusing my attention on spring beaded jewelry! Crystal Allure is Spring-ing into the season with a garden full of colorful blossoms! Previously the bead pendants below were offered as a complete necklace. But, because I offer other bead pendants it occurred to me that you could interchange your Crystal Allure bead pendants with a single necklace chain. You really only need one or two chains and you can create a ton of different necklaces! 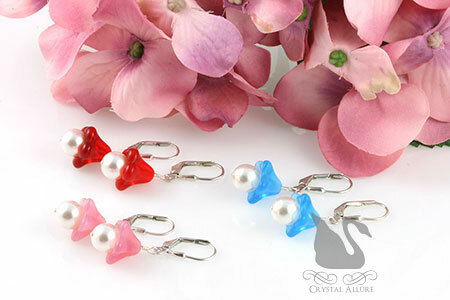 These petite beauties are also the perfect bridesmaids gifts! Contact me for availability on colors if you'd like to add these blossoms to your spring or summer wedding. Beautiful garden flowers inspired these lovely petite spring blossom handmade beaded earrings. Designed with beautiful Czech glass flower blossom bead caps embracing a white Swarovski Crystal Pearl, dangling from sterling silver leverbacks. Czech flower blossom available in blue, pink or red. Length is 3/4" from the bottom of the ear wire. As beautiful as a red poppy flower, this lovely petite handmade beaded pendant showcases an elegant garden poppy red Czech flower blossom softly embraces a white Swarovski Pearl. Bead pendant is shown draped on an elegant 18" sterling silver chain (available separately). Drop pendant measures 1". The shade of pink in this lovely petite handmade beaded pendant is reminiscent of a delicate pink tulip flower. A soft garden pink Czech flower blossom softly embraces a white Swarovski Pearl. Bead pendant is shown draped on an elegant 18" sterling silver chain (available separately). Drop pendant measures 1". One of the first flowers to bloom in Spring is the elegant Daylily flower. As lovely and petite, is this handmade beaded pendant showcasing a soft garden yellow Czech flower blossom softly embracing a white Swarovski Pearl. Bead pendant is shown draped on an elegant 18" sterling silver chain (available separately). Drop pendant measures 1". Elaine had found the Exclusive Live Life Give Life Organ Donation Awareness Bracelet and fell in love with it. She wanted to customize it a little by changing the shape of the green crystals and adding a butterfly charm to represent lung transplant. This is an Exclusive Crystal Allure Beaded Jewelry Design. A symbol of HOPE. A source of AWARENESS. 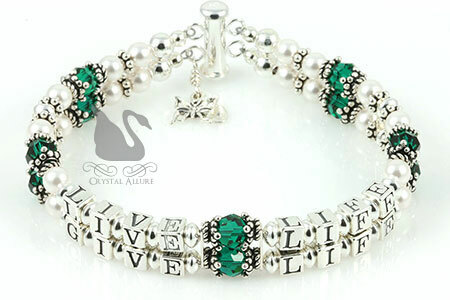 Two strands of sparkling sterling silver, accented with .925 Bali, green emerald Swarovski Crystals and white Swarovski Pearls, bearing the message "Life Life, Give Life" in sterling silver alphabet beads. Finished with a sterling silver slide clasp, signature jewelry tag and customized with a sterling silver butterfly charm. Cuff bracelet measures 7-1/2". This handmade beaded bracelet can be re-produced and made to order. Please contact me for availability and/or customization. The very first meaningful awareness ribbon in history was a yellow ribbon that was tied (no pun intended) to a copyrighted, military sung, marching song in 1917 by George A. Norton. The title of that song was "Round Her Neck She Wears a Yeller Ribbon". But it is the early 1970s song "Tie a Yellow Ribbon 'Round the Ole Oak Tree" that you might be most familiar with. The wife of a hostage, held in Iran, tied yellow ribbons around trees in illustration for her husband to be released and come home. This event was listed as the first time a color ribbon was used, and recognized, as a symbol of awareness. Throughout the years since, many individuals as well as organizations have used color ribbons to raise awareness of various concerns, health issues, charities, support, and hope. One of the more prominent events took place in 1991, when a New York based group of artists and AIDS activists, created and began using a Red Ribbon -demonstrating compassion for people living with AIDS and their caregivers. In 1992, it was declared as "The Year of the Ribbon" by the The New York Times. Fast forward and a Red Ribbon has now become an internationally recognized symbol and icon for over 35 different causes that include: AIDS, Cardiovascular Disease, DARE, Red Ribbon Week, Heart Disease, Lymphoma, and MADD (Mothers Against Drunk Driving) -to name a full. See the full list of Red Ribbon Causes. 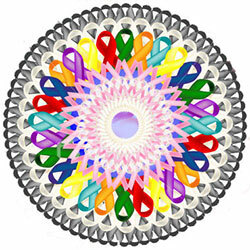 Today, Awareness Ribbons have become symbols drawing attention to health and human issues, as well as, social concerns. There are even some ribbons with patterns, such as the Autism Awareness Ribbon displays as a multi-colored puzzle piece. In the United States, the Yellow Ribbon, symbolizes military service. However, the most widely recognized ribbon is the Pink Ribbon in support of those with Breast Cancer Awareness. Mother's Day is right around the corner! But this exquisitely designed keepsake mothers bracelet is perfect for mom anytime of the year -and for any reason. More importantly, it's a treasured keepsake she can enjoy for a lifetime. Also, makes a great gift idea for the new mom. And what a beautiful sentimental gift to give when baby speaks its' first word(s) and says, "MOMMY". This cherished design features a combination of pink Swarovski Crystals and pink Swarovski Pearls accented with sterling silver beads, Bali and two forever love intertwined circle rings. Sterling letter blocks read MOMMY. 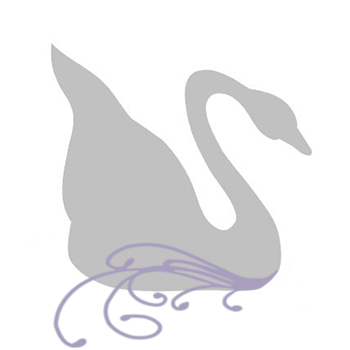 Design is finished with a signature jewelry tag. Measures 7-1/2". The forever love intertwined circle rings are symbolic of the unconditional love Mom's have for their children and just as a circle has no beginning and no end, so to does a Moms love. 2. White Pearl with Clear/Clear AB Crystal. *If you wish to customize this crystal bracelet, please contact us prior to ordering. Oh Marsala, how I love you! So, rich, robust -elegant. Pantone has introduced Marsala, the color of the year 2015, as a "naturally robust and earthy wine red" that "enriches our minds, bodies and souls." Executive Director for the Pantone Color Institute, Leatrice Eiseman, has dubbed Marsala "a unifying element" that has "full-bodied qualities for an elegant, grounded statement color when used on its own or as a strong accent to many other colors" and "a tasteful hue" like a fortified wine (hence the name). I couldn't agree more! 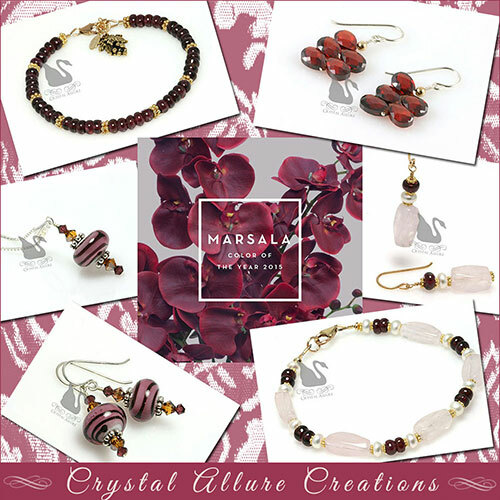 What do you love most about Marsala? Friendship and the full-bodied flavor of Shiraz wine was the inspiration behind this bracelet. Friends are an important part of our lives and this handmade beaded bracelet celebrates special girlfriends and fond memories of a girls' fall wine tour outing. Be at your finest in this richly shaded deep-red garnet gemstone handmade beaded bracelet featuring rhodolite garnet gemstones paired with 14 karat gold fill Bali and lobster clasp. Finished with a goldtone grape bunch charm and signature jewelry tag. Measures 8". 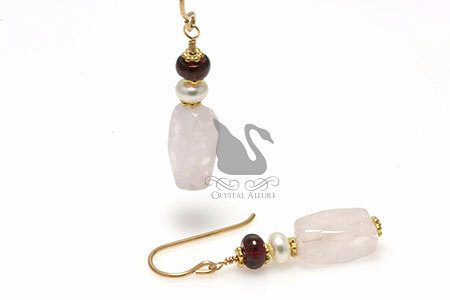 A lovely gentle pink rose quartz gemstone is accented with sassy reddish-purple rhodolite garnet gemstone, sophisticated freshwater pearls and gold vermeil Bali beads. Handmade beaded earrings are finished with 14kt gold-fill french hook ear wires. Length is 1-1/4" from the bottom of the ear wire. A lovely strand of gentle pink rose quartz gemstone mixed with the sassy reddish-purple of the rhodolite garnet gemstone is oh so sophisticated when married with freshwater pearls and gold vermeil Bali beads in this lovely handmade beaded bracelet. Measures 8-1/4". The color Pink also represents the support color for breast cancer awareness. It's another snowy (and now sleeting) day around here, but I don't mind. I know this is not the sentiment of many but I do love winter. Truth be told though, I love it more looking at it through the winter of my cozy home! With spring just weeks away, I wanted to post two winter-themed sparkling pendant necklaces. There is no other time of the year than now (winter) to truly appreciate the beauty of red and green colors. A gorgeous green emerald-cut gem evokes a rustic glam style to this pendant necklace. Handmade beaded necklace features a sparkling 20x15mm deep wintergreen, almost a deep peridot moss green, emerald shaped cubic zirconia pendant on 18" sterling silver cable chain. Choose this pendant necklace for an elegant vintage look. The rectangular shape (also called an "emerald cut") pendant features long, lean lines with a larger open table (i.e., top, flat surface) which highlights the clarity of the deep wintergreen color, more than any other shape. This radiant ruby red diamond-shaped gem evokes an exciting and festive style to this handmade beaded pendant necklace. This classic design features a sparkling 15mm faceted winterberry ruby red diamond shaped cubic zirconia pendant on 18" sterling silver cable chain. 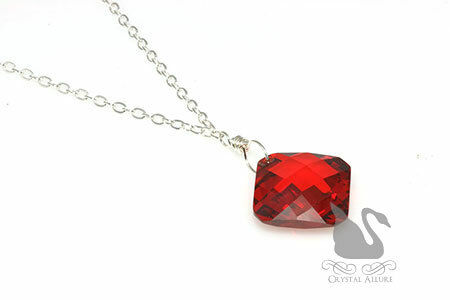 The cut of this ruby red cubic zirconia pendant is unique and has been a popular cut for centuries. It is a square with rounded corners and is actually called a cushion-cut. By hanging it diagonally, it lends a more feminine feel to the style and design. Both necklaces are one of a kind.